This DVD clearly shows how to shape up a horse for show or sale - trim the mane and tail; tie the tail; braid or roll and decorate the mane; groom the face, ears, and hooves; avoid clipper marks on the coat; groom legs with or without feathering; how to (and more important, how not to) apply shipping boots; and how to put bloom on the horse. It mentions sources for all the supplies used in the video, and includes a step-by-step show/sale preparation timetable. 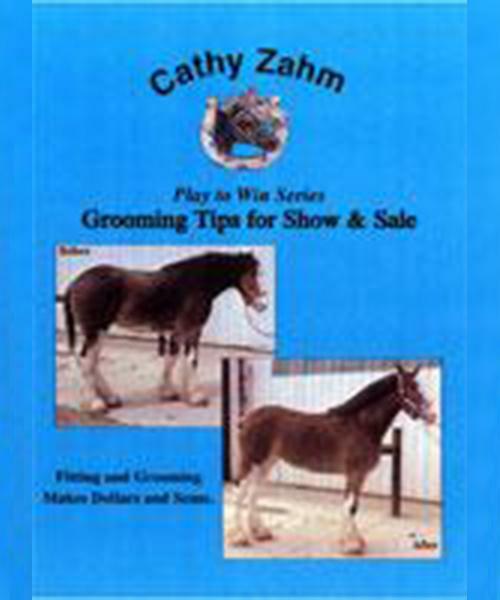 If you already know how to groom a horse, you may find this video a bit slow; but if you want to learn all the tricks of the trade, you'll have a hard time finding a more thorough demonstration than Cathy's.